Democratic House Speaker Nancy Pelosi out polls GOP Senate Leader McConnell…..
McConnell is taking a beating by enabling Donald Trump’s political stumbling…..
Americans have a more favorable view of Speaker Nancy Pelosi (D-Calif.) than her Senate counterpart, Majority Leader Mitch McConnell (R-Ky.), according to a new Hill-HarrisX poll. 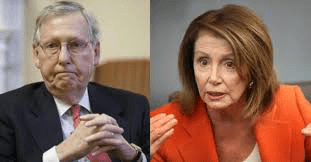 Both of the leaders exhibited relative high unfavorable ratings, with 42 percent saying they had an unfavorable view of Pelosi and 45 percent saying the same of McConnell. President Trump has requested $5 billion in funding to construct a border wall, but Democrats have offered $1.3 billion in border security measures. “What’s interesting is that McConnell has stood back from the fight over the wall and the government shutdown,” political analyst Bill Schneider told Hill.TV’s Joe Concha on “What America’s Thinking” on Monday. “He hasn’t been much in evidence recently, maybe because he realizes, this is a losing cause for Republicans.”…. President’s job performance approval has another noticeable drop in the RealClearPolitics average: 41.4% approve – 55.0% disapprove = – 13.6%.